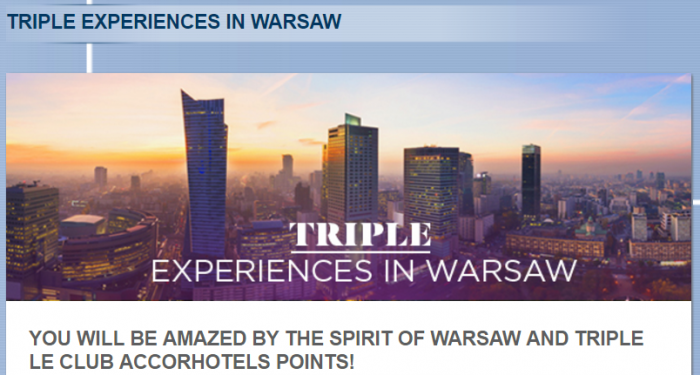 Le Club AccorHotels has launched a new triple points offer for stays in Warsaw (Poland) between November 14 – 27, 2016. The offer is valid for stays booked between October 13 – November 26, 2016. This offer requires you to register on Accor’s website. There is again a date mix up on Le Club AccorHotels web page for this offer. It contradicts what the copy and the T&Cs state. An offer to keep in mind for those than plan to visit this Polish city over the two week period this November. 1. General Le Club AccorHotels terms and conditions apply to the Triple Experiences in Warsaw offer and you must be Le Club AccorHotels member to benefit from it. 2. This offer entitles Le Club AccorHotels members, regardless of their status, to benefit from earning bonus points x3 for a stay in one of the participating hotels in Le Club AccorHotels Loyalty program. 3. This offer is valid for a member’s stay from 14/11/2016 to 27/11/2016 in one of the participating hotels in Warsaw and booked between 13/10/2016 and 26/11/2016. 5. Any consecutive stays (check-out and check-in same day) in the same hotel, will be considered as a single stay. This single stay will be eligible once to the Triple Experiences in Warsaw offer. 13. Please specify the reference 47869 in all your communications with AccorHotels call centers or customers care services related to this offer. You must register for the Triple Experiences in Warsaw offer before proceeding to the booking, to be eligible to the offer. Next articleThe Winner Of The 100,000 Hilton HHonors Points Giveaway Is?